Droyd Cantina: Short Review: "Thumb Keyboard"
I searched for a long time. 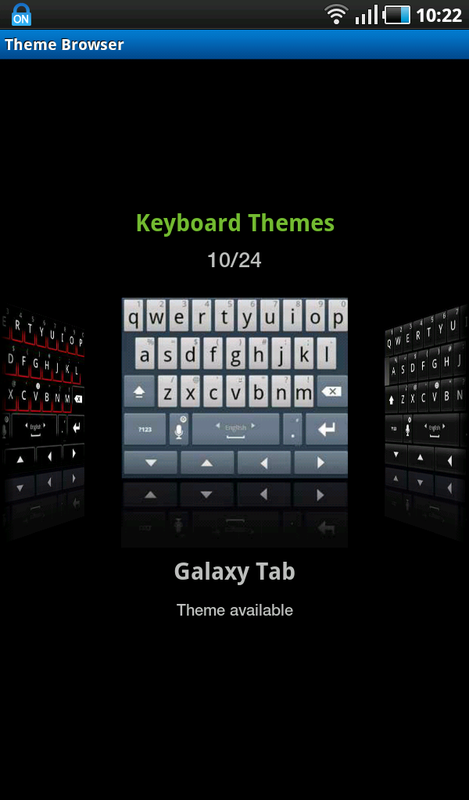 The Gingerbread keyboard s quite good, but on a tablet like the 7" Galaxy Tab, it's not perfect in landscape mode. Besides that most Tabs are still stuck with Android 2.2. Now there is a solution that works on tablets of all sizes and with Android 2.2. It's "Thumb Keyboard". The ESC Hacker Keyboard was my last choice. It came close to the original Gingerbread keyboard and was very customizable. Something that Thumb Keyboard does, too. You can set almost anything. 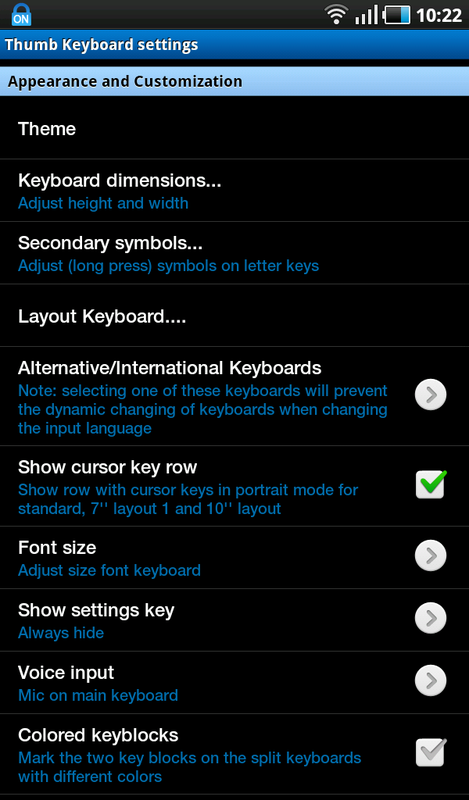 Size of the buttons, fonts, layout, or you can just go fine with the themes and layout that comes with the app. 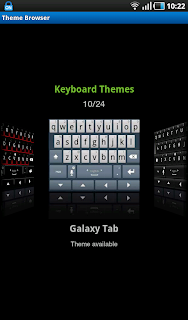 Dozens of themes, and endless layout customization, gives you a nice shot to get your perfect keyboard. The most important feature is the split keyboard. And, unlike the competitors on the market, this is not only for big sizes, or Honeycomb, but for every size and all Android-versions if you like it. It's great on the Tab. In the middle there are cursor-keys(! 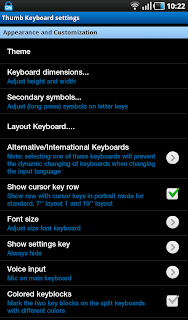 ), which make scrolling to the right spot in a text line a breeze, and a number-pad at all time in landscape mode. There is also a special function key, that opens a menu to select a save text-block. Like a phrase you often use, or a signature etc. You can also make a toolbar visible to add functions to it. The .com button offers other Internet-related stuff on long-press, like a "@gmail.com" suffix. 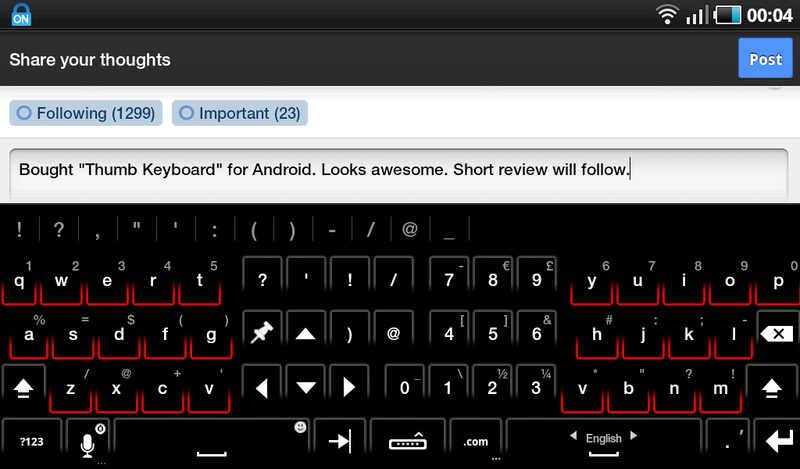 It would take more than a short review to name all the features and functions of this keyboard. Yes, with about 8.5MB installed, you might not want to use this on a low memory device. That's a downturn for some. However, it runs fine on the Samsung Galaxy Tab 7", where I tested it. The speed is good, but I wouldn't use it on a slow device. 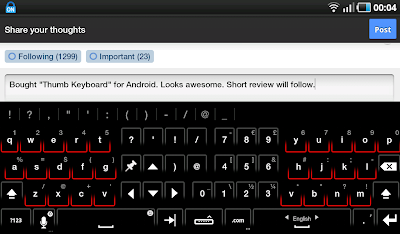 The price is quite good for $2.49 you will get for what I say no less, than the best keyboard on the market.